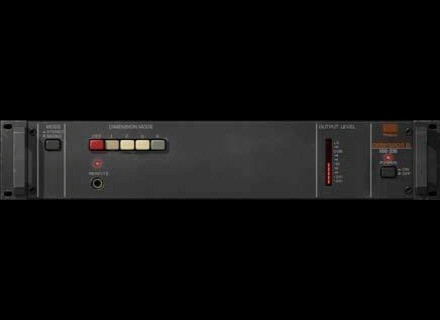 Roland Dimension D, Software Chorus from Universal Audio in the UAD Plug-In series. loudfunk's review"Chorus how it should sound..."
Typical U-Audio, everyhing is how it should be. The Roland SDD-320 Dimension D is another classic effect faithfully repro- duced by our ace modeling engineers. The Dimension D is a one of a kind stu- dio gem that adheres to the principle of doing one thing, and doing it ex- tremely well. Its one and only function: some of the best sounding stereo chorus ever made. However, the Dimension D is more than a chorus, it is re- ally a unique sound enhancer for adding spatial effects to mono or stereo sources. The Dimension D does not create a dramatically new sound, but en- hances the characteristics of any voice or instrument, and gives a new “di- mension” without the apparent movement of sound produced by other chorus devices. The strength of the Dimension D is in its subtlety. This classic 1979 Roland device has been heard on countless records, from luminaries such as Peter Gabriel, Talking Heads and INXS. Entrusted by the Roland company to emulate this classic studio tool, Universal Audio went to great lengths to preserve this Bucket Brigade chorus with all its unique design elements and sonic characteristics. With only four pushbutton ‘dimension’ set- tings, the Dimension D is the ultimate in functional simplicity. The Roland Dimension D is very simple device to operate; it has only three controls: Power, Mono, and Mode. Each control is detailed below. The Dimension Mode determines the effect inten- sity. Four different modes are available. Mode 1 is the most subtle effect, and Mode 4 is maximum intensity. True to the original hardware, multiple Dimension Mode buttons can be en- gaged simultaneously for subtle sonic variations of the four main modes. To engage multiple Dimension Mode buttons, press the Shift key on the computer keyboard while clicking the Mode buttons.